The Little Things Forever iPhone, iPod Touch, and iPad app is a fresh take on seek and find puzzles for kids, and, to be perfectly honest, adults too. The bold, colorful, unexpected graphics coupled with interesting game play make it a fun, smart way to pass time in doctor waiting rooms, restaurants, car trips, and family game night. The Little Things Forever iPhone app has a fantastic visual aesthetic. A large, familiar image like an owl is created by smaller items revealed by pinching and zooming on the larger image. The colors of the objects may be very different than what you would expect, in order to get the right color to create the larger image. This detail also creates a challenge in the game play, as objects may not be the color you normally associate with them. You may be looking for a wrench, but it is kelly green, not gray. 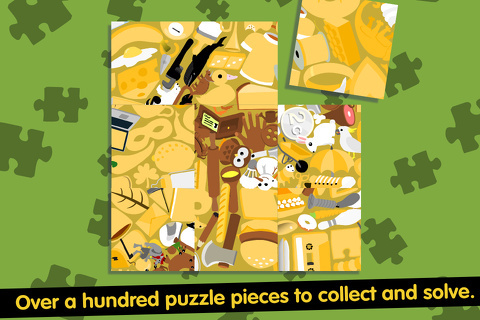 The objects that make up the larger puzzles are a neat blend like triceratops, musical note, shuttlecock, lamp, iPod, ice cream cone, fox, and ghost. It’s fun to see these images, and it is a great way to start a conversation with your kids. I played this game yesterday at the doctor’s office with my son, and we had a blast talking about shuttlecocks and arcade games. When you start your first seek and find with the Little Things Forever iPhone app, the larger image fills the screen and a list of items appears in the top right corner. You slide your fingers apart on the screen to zoom and see the smaller items in better detail. You slide your finger across the screen to see other parts of the puzzle. You can pinch to zoom out and see a larger part of the puzzle. When you find an item in the list, you touch it. Stars appear around it, and the name is eliminated from the list. The hint option is effective and accessed from the bottom of the screen. The screen darkens everywhere but a small area of the puzzle. As time passes, the area of the puzzle decreases in size. It’s like a game of hot and cold–but iOS style. Once you have found all of the items on the list, you earn a puzzle piece. An additional neat touch is the game mode where you race against the clock. For example, in the first level, you want to earn four puzzle pieces. The first three seek and find puzzles operated as described in the previous paragraph, but, in the final seek and find, you try to find as many objects as possible in two minutes. There is only one item on the list, so you look for it and touch it. When you find it, a new item pops up in the upper right corner of the screen. After you have earned a certain number of puzzle pieces, you have a different puzzle to solve. You arrange the puzzle pieces with accurate and agile touches and swipes into a new puzzle. This is the process for unlocking a new level. The touch to incorporate a different puzzle mode to access a new level is unexpected, and you will appreciate this thoughtful addition. The game play of the Little Things Forever iPhone app is easily accomplished by young readers with your assistance, but it helps for your child to have the ability to read complex words. It is a great tool to build vocabulary and problem solving skills. The Little Things Forever iPhone, iPod Touch, and iPad app is an absolute delight and will captivate you and your family. 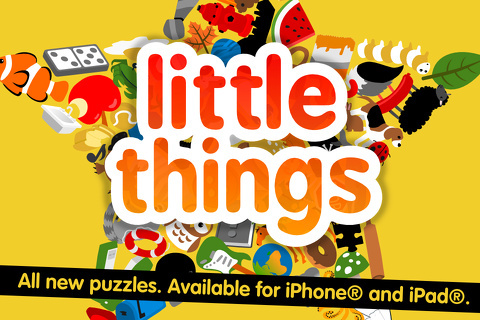 AppSafari review of Little Things® Forever was written by Jenni Ward on March 21st, 2013 and categorized under App Store, Fun, Games, iPad apps, Kids, Kids, Puzzler, Universal. Page viewed 4099 times, 1 so far today. Need help on using these apps? Please read the Help Page.